Kalimantan takes up about 2/3 of the Island of Borneo. 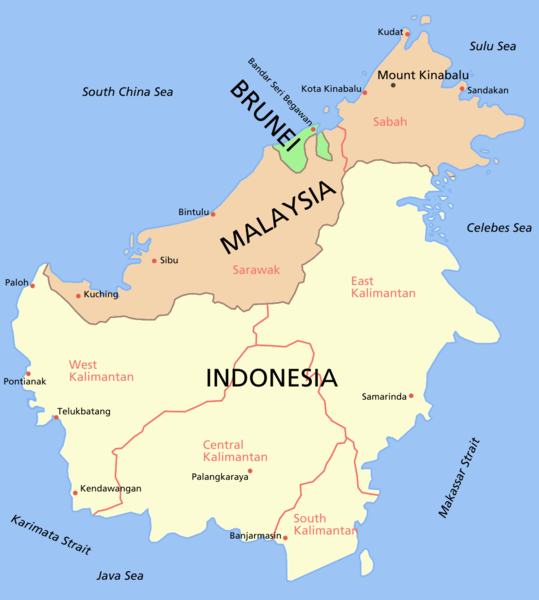 The northern section of Borneo is taken up by the East Malaysian states of Sarawak and Sabah. There is also the tiny, oil-rich, independant sultanate of Brunei. Kalimantan is divided into the four provinces of West Kalimantan, South Kalimantan, East Kalimantan and Central Kalimantan. Kalimantan, which means 'River of Diamonds' is a rugged land with tremendous rivers including the Kayan River, the Mahakam River, the Barito River and the Kahayan River. Kalimantan is still covered by one of the world's largest stretches of tropical rainforest and jungle. Although Kalimantan is home to just 5 percent of Indonesia's population, Kalimantan's 549,032 square kilometers represents 28 percent of it's nation's land mass. Amongst the many ethnic groups Kalimantan is home to the Dayak people who used to be headhunters and very good with a blowgun that shoot poisonous darts. Although they have given up the headhunting days some still live in the traditional villages and live in communal longhouse which house several family groups. As well as Bahasa Indonesia there are a number of languages spoken through Kalimantan including Bahasa Banjar (in southern Kalimantan and Bahasa Dayak. Kalimantan has some of the most unusual and endangered species in the world. These include the Borneo Orangutan, asian elephants, pigmy elephants, long nose monkeys, rhinocerous and various species of primates including monkeys and gibbons. Scientists are still discovering new species of animals in Kalimantan's dense tropical rainforest. In August 2007 an expedition discovered a frog species that does not have any lungs, using it's skin to extract oxygen from the air. The aquatic frog, Barbourula kalimantanensis was found in a remote part of Kalimantan's jungle. It is believed to be the first of it's type found in the world. There are 8 National Parks in Kalimantan being Kayan Mentarang National Park 13605km2, Betung Kerihun National Park 8000km2, Sebangau National Park 5687km2, Tanjung Puting National Park 3550km2, Kutai National Park 1986km2, Bukit Baka Bukit Raya National Park 1811km2, Danau Sentarum National Park 1320km2 and Gunung Palung National Park 900km2. There are many bus services to transport people around Kalimantan though the travel is slow and bumpy. Some sections of the road network has been upgraded recently though the distances are still great so a long travel is to be expected. There are a few smaller airline companies that offer transfers flights within Kalimantan. Kalstar Airways have daily direct flights between Banjarmasin and Pangkalanbun as well as Pontianak and Pangkalanbun. For flights into the various cities of Kalimantan from other airports in Indonesia see the various links below.